Shamati #1: It is written, “there is none else besides Him.” This means that there is no other force in the world that has the ability to do anything against Him. There is a single Upper Force that governs the whole universe. And what man sees, that there are things in the world that deny the Higher Household…in other words, it seems to us that there are many opposing forces operating in the world that overpower one another, and that it is possible to receive help from one force in order to oppose another, using this “multiple power.” …the reason is that this is His will. This one force, which has total power, wants us to become so confused by the multitude of forces, desires, kinds, and qualities, so that from within this mess we would start to gather the only existing force ourselves. It seems to us that this life is multi-faceted and complex, but we have to bring it to one desire, one goal, and one operating force. It’s similar to how we teach children by giving them exercises where they have to assemble and fix something that’s broken, not ready, or incomplete. They have to correct it and complete it on their own. That is how we have to act at every moment of our lives. It seems to us that it is very difficult to work hard in life and to make efforts, but if we did just one thing behind all of these material actions — if we completed the Upper Force in order to see that He is the only one who acts, then we would not need to do anything else! We work in the material world to produce many things, but in reality we are simply running away from solving the only, tiny problem: to discern that behind all of these problems, details, thoughts, and discernments, there is one force standing opposite me. There is me and Him, and between us He has built all of these decorations that confuse me so that through them I would find my way to Him and feel that they come to me form Him! This is called clarification. If at every moment of my life, no matter what I do, whether I am talking to someone, someone is attacking me, or on the contrary, someone approaches me in a good way, or something happens to my health, money, or status at work or in my family, if behind every occurrence I try to reveal the Creator, then I will begin to unite everything into one net as if making an embroidery. I will begin seeing and revealing this system of connections: His program and attitude to me through all of these people and all the possible life situations. I will suddenly understand what happened in the past and will start to see what He will do to me in the future. He slightly lets me see what needs to be done with various problems, teaching me like a small child. I have to accept this life only as a quest for Him — to look for Him and find Him! After all the efforts I make, I should always see that there is none else besides Him and everything comes only from Him! This has to happen to such a degree that when I am in the most difficult and unpleasant situation, when I reach total despair and exhaustion, and I am completely unable to connect it to the Creator, I nevertheless begin to aim it toward the Creator and to look for the reason why this has come to me in this form and where it came from. Then I reveal how wonderful it is…. I begin to put all of the components of the general picture in order and suddenly discover that He has set everything up only for my own good to help me reach newer revelations! Eventually I reveal that everything around me is one interconnected net of His attitude toward me through the entire universe and through all the Upper Worlds. I am surrounded by a force field of His love, and I am at its center. This is called the revelation of the Creator to the creatures. Question: What do we need to do in order to aspire towards the high state of unity that exists in The Zohar? Answer: This comes from disappointment. No matter what I tell you now, it will not help until you develop an urgent need, aspiration, a vital necessity. Only then will you turn to the group. When you know that you have a big problem, your life is at risk, or you are ill, then you run for help. But when you do not feel ill, do not see that there is a problem, or do not believe that anything will help, you remain still. This is why we need a deficiency. Either the Creator gives us a deficiency as He pushes us from behind with suffering, or we make a connection with the environment without waiting for suffering and try to receive an opposite reaction from it. Then we receive additional desire from the group. This is how it works. Those who are lucky will hear, turn to the group, arrange for this booster of desire, and come to the Creator though the group. 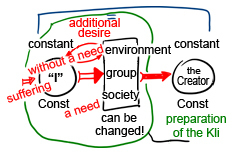 Ultimately, the group needs to direct a person towards the Creator. The connection with the group and our entire work is the preparation of the desire, the Kli. And then we come to the Creator. Question: During the Convention we really wanted to attain the goal, and then we discovered that our ego would not let us do it. Why won’t the Creator answer our prayers and let us rise above this mountain of egoism? Why are we unable to do this? Answer: The Creator is the general force of bestowal. He created our force of reception. These two forces stand one opposite the other like stringers of a ladder with rungs in between. As you correspond to a higher step, you ascend to it, advancing to a new degree one step at a time. Everything is in your hands. You have been given a key to nature in order to change your own nature and make it similar to that of the Upper One. You ascend as soon as you become similar to it, but when you are different from it, then you remain in the same place. It does not depend on the Creator, His desire is constant; He is Good and does Good. The Creator does not change, this force is absolute and invariable. But in order to let you ascend, the Creator divided the entire path into steps or states. Every time that you are like the Upper degree, you ascend to it, and as you become even more like it, you continue to ascend higher. Between each step, you have to prepare yourself for the following step, and this way you continue ascending each time. You have no one to pray to, no one to ask. This is why you can’t object: “Why won’t the Creator help me? Where is He? Where did He go? What is going on? What else does He want me to do?” Essentially, when you pray and ask, you are judging yourself in relation to the Upper Light that shines for everyone in an equal, constant, and unchanging manner. Everyone can take as much as he wants from it. It is written about the Creator: “I do not change my HaVaYaH,” “There is none else beside Him,” “The Good Who does Good.” He does not change. When you correlate your properties to His, as if He were thinking about or reacting to your cries, then you are making all of it up. Throughout history people have been attributing human characteristics to forces of nature: the wind, the rain, the moon, as well as the Creator. But this does not exist! We are working against nature. Kabbalists explain to us that Nature where we exist has its own laws. In Hebrew, the numerical value (Gematria) of “nature” and “Creator” is the same. We can use these laws and continue to ascend its degrees time after time until we reach the universal Nature referred to as the level of Bina, the Creator (Elokim). This is why it is clear to me that if I have not yet received it, then the problem is in me. I have no one to fear and no one to ask. It is correct to say that the Creator rules over us. Doesn’t nature rule over us? Yes it does. Tsunamis, hurricanes, and other natural disasters occur, and it is surely nature’s rule over us! In nature, there are two opposite forces which constantly collide and battle: the force of bestowal and that of reception. It all happens according to the program that leads us towards the purpose of creation. In the beginning these forces are completely opposite, but they gradually become closer until they unite. This is the process of development in nature. This is why you have no one to work with but the group. You can change yourself through the group and make your properties similar to those of nature. The group is an adapter between your desire, which you do not control, and the Creator, whom you cannot control either. The group, the society, the environment, is your only power; it is the only thing you can change. Hence, if instead of advancing unconsciously according to nature’s program that leads the entire creation towards unity with the Creator, I want to change something; if I want to advance towards Him on my own, and not by nature’s cruel forces, then I only have one choice: to work with my environment. But if, God forbid, it is to the contrary, and a person from Israel degrades the virtue of the internality of the Torah and its secrets, which deals with the conduct of our souls and their degrees, and the perception and the tastes of the Mitzvot with regard to the advantage of the externality of the Torah, which deals only with the practical part? Also, even if one does occasionally engage in the internality of the Torah, and dedicates a little of one’s time to it, when it is neither night nor day, as though it were redundant, by that one dishonors and degrades the internality of the world, which are the Children of Israel, and enhances the externality of the world – meaning the Nations of the World – over them. They will humiliate and disgrace the Children of Israel, and regard Israel as superfluous, as though the world has no need for them, God forbid. You are revealing the evil that does not let you enter the spiritual world as a wall that stands in front of you. Also, you cannot break through it alone, only together. To do this, we have to unite in a group, which is the only free action that we are able to perform. Having gathered together, we have to draw the power of the Creator to us and break the wall with it! Now I stand before the same egoistic wall, but I am no longer alone; I stand as many points in the heart connected together and called a “Kabbalah group.” This is a huge force that can easily break the wall. We reveal the Creator inside our connection because without the Creator, we are unable to connect! I ask the Creator and He connects me with the others. The others ask the Creator for the same thing and they also get connected. By this we introduce the force of the Creator between us. He unites us, and with the same force we break the wall. It’s because the wall isn’t outside of us, it’s between us. By working on your connection with others, you are basically preparing yourself for a breakthrough. What does it mean that the people of Israel exited Egypt? They united with such a force that the wall collapsed; they ascended above their egoism. This is what escaping from Egypt means. There are no walls outside. The wall is revealed to show us that we don’t want to connect with each other; it’s a revelation of the wall between us. Now bring the Creator so that He will break it. That’s it, nothing else is required! We should continue on without being too smart. Our main work is done in concealment, unconsciously; this is the preparation period. Thus, it’s important to follow the methodology even if we don’t fully understand it, just as a child doesn’t understand how he grows up. The wall is between us and our only free action is directed against it. One can work on this connection even if he watches the lessons at home on TV because our connection is not physical; we do not connect to each other with handcuffs or iron chains, only by inner desire. Therefore, even if I’m far from a center, I can still join as if I’m in the center itself. The distance doesn’t matter; it’s only the desire and devotion to the goal that do. The same wall that we feel between us right now will turn into glue that will bond us together in the end. The same Pharaoh that stands between us will become the Creator. This means that we run from Pharaoh and come to the revelation of the Creator. We don’t move anywhere; this is done within the group, but instead of feeling the breaking and rejection, we reveal the glue and connection. This is purely a psychological problem that we’ll overcome, and then suddenly the difficulty will turn to the power of connection, the angel of death into the angel of holiness, and the grave into the mother’s womb. What does it mean to reach Infinity? When I enter Infinity, I become Malchut of the World of Infinity, which means I contain everyone within myself. After all, “love your neighbor as yourself” means that all those whom I now see and feel as outsiders become essential components of my soul. My soul receives back all its parts, scattered and distanced from it, and it becomes a whole, completed soul. Everything that seems to exist outside of me, such as still objects (imagine that you are swallowing all the stars! ), are related to the still level of your egoistic desire, all plants are related to its vegetative level, and all beasts to its animate level. All of it is an imprint of your egoistic desire that is showing you all of these things as if they are located outside of you. However, as soon as you start growing an organ, an attribute of bestowal, you start seeing them as existing within you. They are all your parts, and you feel that it is true. For the time being, however, it is difficult for you to comprehend since you live inside your ego and only inside it. However, some day, after long contemplation, questions, and discernments, you suddenly will feel that everything is quite different. You will see it from a different angle, and then you will understand that this new vision is true. It is as if you put on a new pair of glasses.